Determination of the maximum deflection of a three-dimensional block fixed at the both ends. 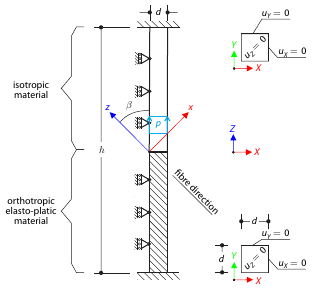 Block is divided in the middle: The upper half is made of an elastic material and the lower part is made of the timber - an elasto-plastic othotropic material with the yield surface described according to the Tsai-Wu plasticity theory. The block's middle plane is subjected to the vertical pressure. 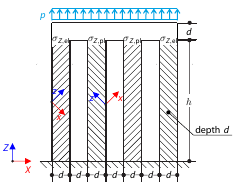 Determination of the maximum deflection of the four columns fixed at the bottom and connected by the rigid block at the top. 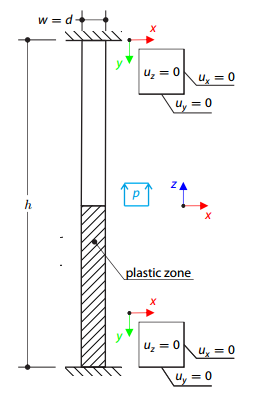 Block is loaded by the pressure and modeled by an elastic material with high modulus of elasticity. 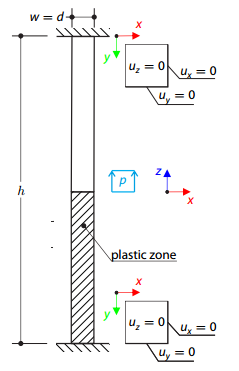 Outer columns are modeled as orthotropic elastic material and inner columns as orthotropic elastic-plastic material with the same elastic parameters as outer columns and with plasticity properties defined according to the Tsai-Wu plasticity theory.